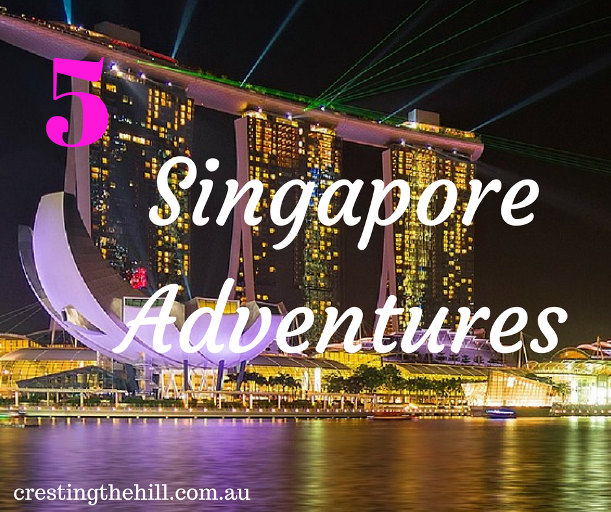 This week has been Singapore Week, so to finish it off here are five interesting things to do if you ever visit this amazing place. 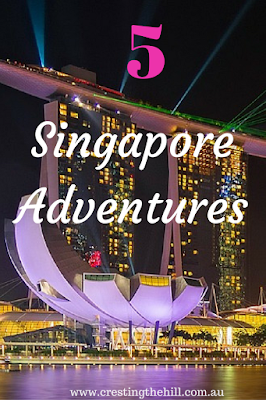 Some were active and some were scenic and some were all about the shopping - because you can't go to Singapore and not shop! I blogged about this on Monday - because it was way out of my comfort zone! This walk was more of a climb than a stroll. Lots of steps to get up to the top of the ridge, beautiful tropical plants and great views out over the harbour and the city. You get to see where the cable car leaves from and there are some lovely flowers, plenty of places to sit and cool off, good quality paths and bridges and a gorgeous park (Hort Park) to soothe the senses. I must say it was a bigger challenge than I anticipated, but (with a bit of whining on my part) I managed to get through it all and actually enjoyed most of it (not the stairs). The humidity added a layer on top - everyone was perspiring profusely - a wet towel would have been wonderful. A hat was essential - sunglasses were fine but tended to slide off in the wetness of all that perspiration! This was such a fun and touristy place to visit. It was at least 3 storeys high, with hundreds of little stalls selling watches, shoes, clothes, toys, jewellery, fruit juices, and the list goes on. All cheap and pitched at the tourist trade - although there were a lot of locals there too. It was right over the road from the Bugis Steet multi-storey shopping plaza where there were more expensive and better quality things to buy and some great food places selling anything and everything your Eastern or Western heart desired. I even found a Starbucks for a coffee (Singapore coffee is not my idea of coffee - lots of hot water and very strange tasting milk) so it was nice to get a good old Starbucks one. Oh man, these are spectacular to say the least! You could walk for hours through the beautifully manicured pathways that led to dozens of different styles of gardens. It was free and fun - there was even a great little children's water playground - that I was very tempted to gatecrash so that I could run under all those water fountains! 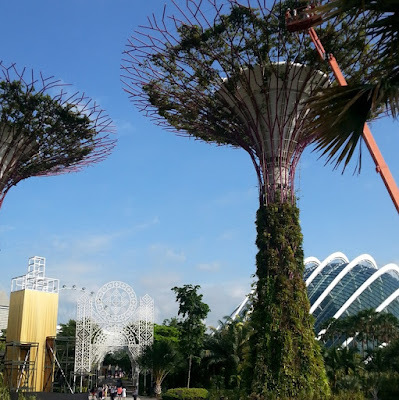 We paid the entrance fee to the Flower Dome and the Cloud Dome - both of these were amazing - completely enclosed under glass, fully airconditioned and two storeys high for the Flower Dome and four storeys high for Cloud Mountain. It was beyond description - so many plants, waterfalls, flowers, themed central displays, overhead walkways and viewing platforms. There was a "misting" at certain times where they turn on a fine mist to give the feeling of being in the clouds - just glorious! 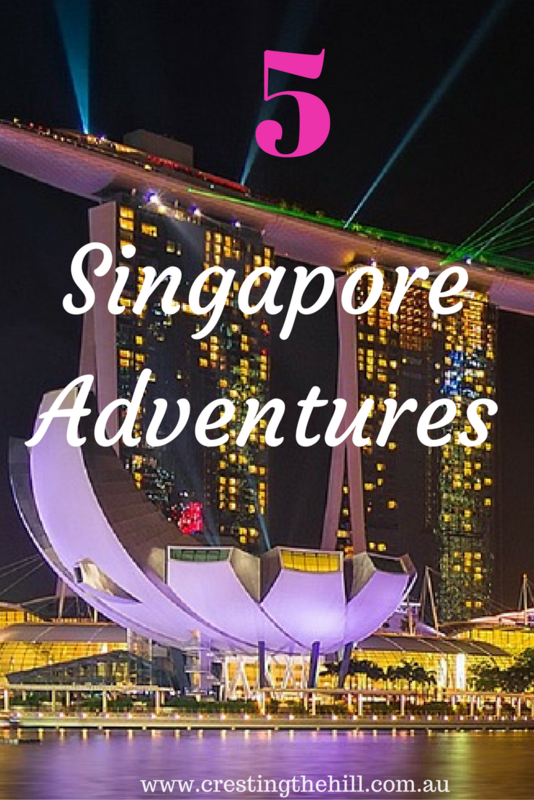 Finally there is the night time light show - beautiful and also free to watch - the Singaporeans certainly know how to put on a show. The craftsmanship in the giant trees, the lights, and the atmosphere have to be seen to be believed. 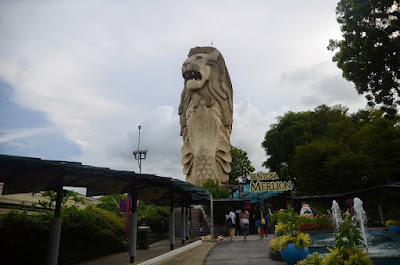 Singapore is renown for its Botanic Gardens - a sprawling park full of gorgeous plants, sculptures (I loved these) grassed areas, the orchid house and lovely places to stop and enjoy the green vista. It's wonderfully shady too - which is a huge bonus when you're walking in the tropical heat. It was in the process of being decked out for Christmas and baubles and plantings were going up all over the place to add to the charm. They even had a little tree for each country's Christmas traditions - it would have been quite a sight to see once they were all finished. From there it was a 15 minute walk to Orchard Road and all the shopping your heart could wish for - most of it is way out of my league - designer shops abound! 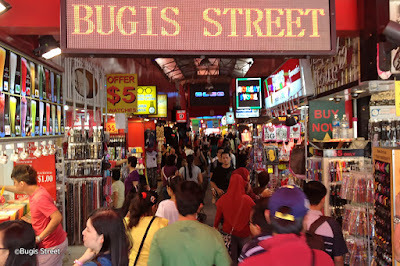 But there are also affordable shops tucked into the giant shopping malls if you are prepared to dig around - mind you every mall was five storeys of shops and it was a little overwhelming for my less than thrilled husband! You could probably spend a couple of days on Sentosa Island and not see and do all that's on offer. There are shows to see, adventure rides, theme parks, beaches, a giant aquarium and maritime museum, food places by dozen, and so much more. Nothing is cheap, but it is clean, and there is something for everyone. We pre-booked a ticket each which included a hotel pick-up and enterance to the main area of the island and one of the attractions, and from there we had free range. We bussed over, but there was also the cable car ride if you wanted to experience the scenic route. Once you're on the island, there was free transport between the main areas - monorail, bus or your own leg power. We tended to walk because that's my husband's favourite mode of transport, but the monorail was fun and everything was close by. And the taxis were easy to find to make our way home afterwards - a big plus after our Ridge Walk experience! Looks like you had a fabulous time Leanne. The botanic gardens are on my list if we ever get back there. Thanks for sharing your adventures with us at #overthemoon link up.